The Little Blue is the smallest model in the Aquarium's three model penguin size comparison display. The two others are Emperor and Magellanic. The display is a very popular phographic opportunity. The Aquarium’s Little Blue Penguin is one of three models in the June Keyes Penguin Habitat that illustrate the wide size range among the world’s penguins. The Little Blue is the smallest of the three penguin models, (Emperor, Magellanic, and Little Blue), that provide our visitors with a ‘photographic moment’. New Zealand: south and north coasts of North island, southeast coast of South Island, west and southeast coast of New Zealand Island and Chatham Island. Australia: southern coast as far north as Port Stephens in the east to Fremantle in the west. Little Blues are temperate water penguins, inhabiting both offshore islands, preferably with rocky shorelines, and mainland sites near or in urbanized areas. The head and upperparts of adults can be slate-blue, indigo-blue, or almost black. The shade of blue varies by geographic location of the penguins. Small slate-grey feathers cover the ears, fading to white underneath, from the chin to the belly. The flippers are blue. The 3-4 cm, (1.2-1.6 in) bill is a dark grey-black. The eyes are pale silvery- or bluish-grey or hazel, and the feet are pink above with black soles and webbing. Juvenile birds have a shorter bill and lighter upperparts. Hatchlings are covered in black down that is replaced in 8 to 14 days with chocolate brown down. At 26 to 29 days the down is replaced with feathers. Standing height: 36 to 43 cm (13 to 15 in) Length, the measurement from the tip of the beak to the end of the tail, is several inches longer. Weight: 0.9-1.4 kg (2-3 lb) The weight of these penguins varies seasonally. They are heaviest when they start the breeding season after spending several months foraging, and at the end of the breeding season after their pre-molt foraging. Both males and females lose weight during the breeding season when they are caring for eggs and feeding chicks. Adult Little Blue Penguins usually forage every day about 25 km (15.5 mi) from shore in shallow waters where prey is close to the surface. They leave land at dawn under cover of darkness, spend the day at sea foraging in small groups, and return to land at dusk, again under cover of darkness. If there is thick fog and low visibility, they remain offshore. During the breeding period in which they are incubating eggs, foraging take two to three days. During the non-breeding winter season, they may swim further from the colony. In larger colonies, over a period of 60 to 75 minutes hundreds of penguins may leave the land for foraging areas. Their diet varies seasonally and by location. In some locations anchovy and sprat are preferred. In others the fish of choice is sardines, and in still others, the preference is krill and sometimes squid. In addition to food preference, their diet is impacted by seasonal changes in ocean currents and temperature that affect food supply. Small fish are swallowed head-first under water; fish more than 3 cm (1.2 in) long are eaten at the surface. Prey is captured by pursuit diving to depths usually less than 20 m (66 ft). Dives usually last 20-35 seconds. Little Blue Penguins usually breed for the first time when they are two to three years old. They have the most unpredictable breeding calendar of any penguins with the first egg being laid in some locations between May and August and in others between September and December or June and August. These penguins are able to raise two pairs of chicks in one breeding season, an ability unique among penguins. Research studies have shown that older adults are more likely to lay two clutches than are young adults, and their eggs and chicks have above average survival rates. Most males and females form life-long pairs. The male usually arrives at the nesting site first and renovates last year’s nest or selects a site for a new one that he digs using his bill and feet. He then stands in front of the nest and waits for the female. Nests vary by location with underground burrows under thick grass roots preferred; however, nests may be in rock crevices or caves. Burrows are usually about 2 meters (6.6 ft) apart and lined with grasses, leaves, or seaweed. In mainland urban areas, nesting may occur in man-made cavities under buildings, stacks of wood, and even railroad tracks. In some areas they also nest in artificial nest boxes supplied by humans. The female lays a clutch of two eggs two to three days apart. Each egg weighs about 54 g (1.9 oz). After laying the eggs, which will be incubated for about 35 days, the female leaves the nest to go on an extensive foraging trip during which the male has the incubation duty. When the female returns, the pair split incubation duties and foraging equally. The eggs hatch in about 35 days. Little Blue Penguins are dedicated parents and they feed and care for both chicks equally. The adults alternate almost daily in guarding and feeding the chicks for about six weeks. Then the chicks venture from the nest and stand outside it waiting for the parents to return with food. At this time parents forage and feed the growing chicks together. At eight weeks of age, the chicks have become juveniles that are the same size as their parents, have molted replacing down with waterproof feathers, and are independent. On returning from their daily foraging trips, these shy nocturnal penguins quickly run to any temporary underground cover they can find to hide in while resting. Later they hide for most of the day in burrows, and in breeding season, in their nest burrow. Molting takes place after the chicks fledge, a time that varies each year for Little Blues. Adults go to sea for two to three weeks to build up their body mass so as to be able to cope with the energy demands of the molting process. After a pre-molt start at sea, the adults return to the land to actually molt, a process that takes several weeks. During this time they do not eat, and at the end of the molting period will have lost 40 to 50 percent of body weight. If the penguin has not gained sufficient weight while at sea, it may not survive the molt. Molting is a traumatic event demanding high expenditures of energy. During the process metabolism slows down and the birds usually just stand still trying not to expend any energy. Little Blue Penguins are very noisy as if to make up for their small size. Calls are distinctive for each adult or chick and are used in bonding, courtship, defense of territory, aggressive behavior, and as a way to recognize each other. Males use different brays when calling for relief of nest duties and for bonding displays. Grunts, roars, brays, and various beeps are used when in an aggressive mood. They use a special call in disputes about territory. At night and especially during the breeding season, there is considerable noise and calls can reach a fever pitch in the colony. Chicks have a high-pitched beep that develops into adult vocalization close to time of fledging. Little Blue Penguins are considered the most primitive of all penguins. They are believed to have evolved in New Zealand and spread to South Australia. These flightless birds have about 10,000 feathers, three to four times the feather density of birds that can fly. The feather bases are very downy trapping air and providing an effective insulation when the penguin is at sea. The feather tips are very stiff which prevents them being compressed by water pressure, stopping the insulating air layer from being squeezed out. Their countershading, dark when viewed from above, and light when viewed from below, protects them from predators swimming above or below them. The population of Little Blues is considered to be stable in most locations. There are about 1.2 million individual birds with 500,000 breeding pairs. Declines, however, have been observed in some areas, especially in urbanized areas and island locations where predation is high. Oil pollution from wrecks and deliberate discharge in their foraging areas are one of the gravest threats penguins and other seabirds encounter both onshore and at sea. In October 2012, a freighter struck a reef near New Zealand’s busiest port. Heavy fuel oil spread from cracks in the ship’s hull and washed ashore. An estimated 20,000 birds, among them Little Blue Penguins, were killed as a result of the spill. Some Little Blues were rescued and after treatment released back into the wild, but the number was small. In 1995 an estimated 8,000 to 18,000 penguins died at sea as the result the spill of bunker fuel oil along Tasmania’s north coast. The small size of Little Blues and the proximity of their habitats to urbanization makes them especially vulnerable to a variety of significant threats resulting from human activities. These include predation by introduced mammalian species—weasels, foxes, ferrets, cats, and dogs. Uncontrolled dogs are a problem in urbanized areas where they roam popular beaches close to nesting sites. Feral cats have been responsible for extinction of one colony of Little Blues. Other threats on land include plastic pollution, roadkill, human harassment, tourism, and development destroying nesting sites. Eggs and chicks in the breeding sites are subject to predation by water rats and predatory seabirds, especially gulls and Sea Eagles. Their predators at sea include fur and leopard seals, killer whales, gulls, and White-bellied Sea Eagles. In addition to oil pollution, other human activities include being caught in fishing nets either as entanglement or by catch and competition from commercial fisheries in foraging areas for their food supply. Sea level rise as a result of global warming may inundate coastal breeding habitat and rising coastal ocean temperature may reduce food availability. A properly dressed oiled penguin. | Courtesy of Craftside. 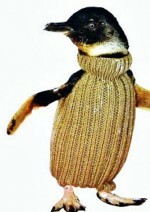 Tasmania’s Penguin Jumpers Project has stored 15,000 sweaters in Oil Spill Response Kits around Tasmania. If there is a major oil spill, these jumpers (sweaters) will be used to help rehabilitate Little Blue Penguins that have been oil affected. Oil clogs the feathers of these tiny seagoing birds, and reduces their insulating and waterproofing qualities. Even worse, the penguins attempt to clean themselves by preening, and rapidly become poisoned. In New Zealand, crafty Good Samaritans responded to appeals for sweaters in 2002, 2007, and 2012. The appeals stemmed from oil spills at sea. The White-Flippered Penguin is currently classified as a subspecies of Little Penguins (Eudyptula min albosignata). Some taxonomists believe this penguin is just a color morph while others believe that based on DNA evidence, the birds that inhabit some locations in New Zealand should be named a separate species of Eudyptula. White-Flippered Penguins are listed as endangered by the IUCN. The U.S. Endangered Species Act lists them as threatened. New Zealanders call this penguin the Little Blue Penguin or just Blue Penguin. Australians call it the Fairy Penguin. These common names come from their small size, the smallest of any of the world’s penguins, and the distinctive slate-blue or indigo-blue coloration of the feathers on the top of their body. Their scientific genus name, Eudyptula, means ‘good little diver,’ which they are. These penguins do not migrate. They are year-round residents of their island and mainland locations in the Southern Hemisphere. When they leave the land to forage in shallow inshore waters, they do so in flocks at dawn under cover of darkness, spend the day at sea, and return to land at dusk. The dawn to dusk behavior in flocks provides them with protection from predators.